So you spend all day in a farm; you’re walking through mud, fertilizer (and the rest!) and you’re looking for a wellington that won’t let you down. Throughout this post we’re going to be exploring what exactly makes a wellington suitable for agricultural use and examining rubber content. We believe a quality pair of wellingtons is a worthwhile investment for all of our customers, and this investment is all the more important when you spend all day in your boots. The majority of our boots are made with a high natural rubber content, which has then been paired with other elements in order to enhance the strength, flexibility and durability. Wellies with a higher natural rubber content are generally more flexible, allowing them to move better with your feet. They are generally therefore much more comfortable than a synthetic rubber boot. However, having a high natural rubber content alone is not sufficient, especially if you’re working in agriculture or with horses. What’s important to remember is that natural rubber can be subject to erosion; therefore you need the right pair of boots and they need to be maintained and nourished. The acidity of animal urine and faeces can have adverse effects on your wellingtons, so if you wear your boots in this type of environment it’s extremely important to choose a pair of boots where the rubber has been formulated to withstand this acid. The best manufacturers produce boots where the synthetic elements paired with the natural rubber are specifically designed for this. It’s also important for you to clean your boots off after use. This is best achieved by simply washing the boots with clean water. No chemicals are needed and they should be left to dry naturally – not by the fire as this dries the rubber out too much. Also avoid leaving your boots out in the frost or in direct sunlight, as again this accelerates the natural process under which rubber will perish. In order to maintain your boots we advise regularly applying a silicon spray, which helps keep the rubber moist. 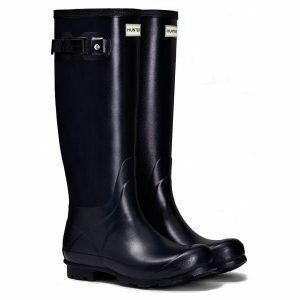 Most manufacturers produce a version suitable for their wellingtons. The Hunter Norris boot was developed as part of the Hunter field range; the boots are lightweight, comfortable and durable. They are constructed from an innovative soft rubber compound, which provides both strength and flexibility, the zigzag tread provides support for challenging terrains, which would prove useful on your farmland, whilst the soles have been redesigned to further enhance the durability of the heel. The chemical formulation of this range is designed with agricultural use specifically in mind, and correctly maintained you should get many years of use out of a pair of these boots. Le Chameau have developed an entire range of quality wellingtons dedicated to agricultural use; the Le Chameau Ceres range, produced in collaboration with Michelin – yes that’s right the tire manufacturer! The Ceres range saw Le Chameau adapt the use of Michelin’s latest tire grip technology, specifically utilizing this on the sole of the wellingtons. This grip technology is used to ensure that you have sufficient track for your needs; this is achieved by an increase in the number of contact zones meaning you have strong contact with the ground when walking, even in adverse weather conditions or a wet stable. Whilst the Michelin Agri sole provides you with the strong sole you require for your agricultural needs, this doesn’t compromise on other Le Chameau elements that we love. The boots are light and comfortable, and the tread incorporates an auto-cleaning structure which brushes away debris whilst your walk. 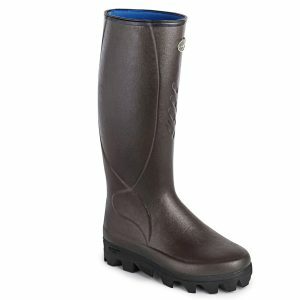 So if you’re a countryman shopping for Le Chameau wellingtons make sure to check they’ve got a Michelin Agri sole – the reinforced farming boots! We hope you’ve enjoyed reading our post, take a look at our website and if you have any queries please do get in touch. barbour, Country Clothing, Dubarry, Dubarry boots, hereford, hunter boots, Le Chameau, Musto, Philip Morris & Son, shooting, wellington boots. Bookmark.